Laurel is an evergreen bush or tree grows up to 3 feet tall (up to 50 feet if left to itself in tropical climates), the leaves are leathery, lanceolate, and pointed at both ends. Whitish flowers grow in axillary clusters during April and May, developing later into black, egg-shaped berries. Seeds are about the size of a pea and have a dark brown color. The plant is pungent and aromatic. Other varieties: Indian Bay, also called California Bay is native to California and was formerly used by the Native Americans for flavoring food as well as for medicine. Indian Bay leaves have a flavor similar to common Bay, except that its leaves are decidedly more fragrant and have a peppery tang. Another variety of Bay, found growing in the Monterrey regions of Mexico, is better known as Boteka. This variety has a cool, mild fragrance. Boteka is also used to make a very pleasant tea. Grows both wild and cultivated around the Mediterranean Sea. 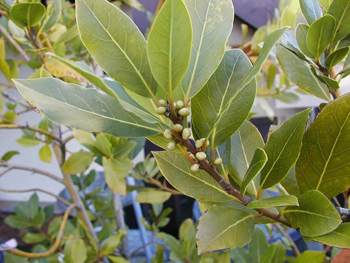 Bay leaf or laurel leaf is aromatic and slightly bitter in flavor. Well known for its uses in seasoning of meats, stuffings, sauces, marinades, etc. Fresh or dried, use bay leaf sparingly, it is strong. One leaf or less for 6-8 servings. According to Greek and Roman myth, the nymph Daphne was changed at her own wish into a laurel tree by her father, the river god Peneus, to keep her from being attacked by the love-smitten god Apollo. Eros (Cupid) had played a trick on the self-righteous Apollo by shooting arrows with opposite effects into him and Daphne: Apollo’s arrow stimulated love for Daphne, but hers caused her to hate Apollo. Apollo, amazed by Daphne’s transformation, made the tree sacred to himself and declared that he would wear a crown of its leaves, as would triumphant men of war. Thus associated with fame and achievement, the laurel wreath was conferred also on poets, athletes, statesmen, and other notables. The Romans believed that a person standing under a laurel tree would be shielded from infection by the plague and also from lightning. In the Middle Ages, laurel would shield you from lightning and from witches, too. Bay oil, pressed from the berries and leaves, can be made into salves and liniment for rheumatism, palsy, convulsions, cramps, aches and pains, earache, tremblings, numbness, bruises, sprains, and skin problems, itch, scabs, eczema, bruises, sunburn. The fruit and leaves stimulate the digestive system. A decoction of fruit or leaves, made into a paste with honey or syrup, can be applied to the chest for colds and other chest problems. Berries are used to remove obstructions, ague (violent fever often associated with malaria), gas, colic, indigestion, to promote abortion, for delayed menses, helpful in expelling afterbirth and during childbirth, treats poisonous insect bites, snake bites, wasp stings, smallpox, typhoid fever, measles, diphtheria, chronic coughs, asthma, worms, increases flow of urine, gargle for sore throats, tonsillitis, lung problems. The bark is used for stones in the kidneys, bladder problems, and various liver problems. Berries are also useful as a cough syrup. The leaves are used to drive away fleas, lice, moths, and bugs in flour and cereals. Infusion: 1 level tsp. granulated bark from the roots in 1 cup boiling water. Steep for 1/2 hour and drink from 1 to 3 cups per day. Tincture: apply externally for bruises and injuries, and internally use only 5-20 drops. Do not use this herb during pregnancy; it may cause miscarriage.